Yielding more calendar photographs than any other warbird show, the 2010 Chino Air Show held its title as the premier west coast warbird show. We let the photographs tell the story. Who needs words when you have images like these? Is it a bird? Is it a plane? No, it’s the stunning new Rapide recently restored to perfection by AvSpecs Limited in New Zealand, now flying with the Military Aviation Museum in Pungo, Virginia. When it comes to formation flying the FAST program sets the standards for safety and proficiency. Owners of Yaks and CJ’s have been the fastest growing segment of the formation flying community, and from their ranks the warbird community has gained a group of formation pilots second to none. Jim Beasley is known as one of the best warbird pilots in the business, so we asked him to take us on a journey flying the Griffon powered Spitfire Mk. XVIII. To document the 75th Anniversary of the C-47, photographer Scott Slocum had a goal of photographing a Heritage Flight of the old C-47 and the new C-17. He teamed up with dedicated pilots to get the job done. Behind every complex warbird are individuals who keep them flying, using a mixture of art and science. Rich Palmer explains the trials and tribulations encountered on the journey to getting Jim Beasley’s Spitfire Mk. XVIII assembled and debugged. Nearly 70 years after a Russian pilot was shot down in his MiG-3 by German fighters, his plane flies again. It took extreme dedication to recover the remains and transform them into a like-new aircraft. 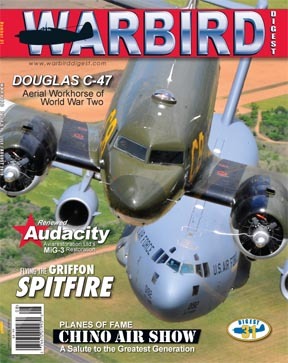 This year we celebrate the 75th Anniversary of the Douglas C-47. Nobody explains the history better than an expert on the subject, so we asked Ted Young to share his knowledge. A special gift can change a life. In the case of the Vintage Aero Flying Museum one such gift planted a seed of passion that grew into an amazing collection. From this special museum three daring pilots trekked 2,500 miles in aircraft designed to fly a few hours at a time.